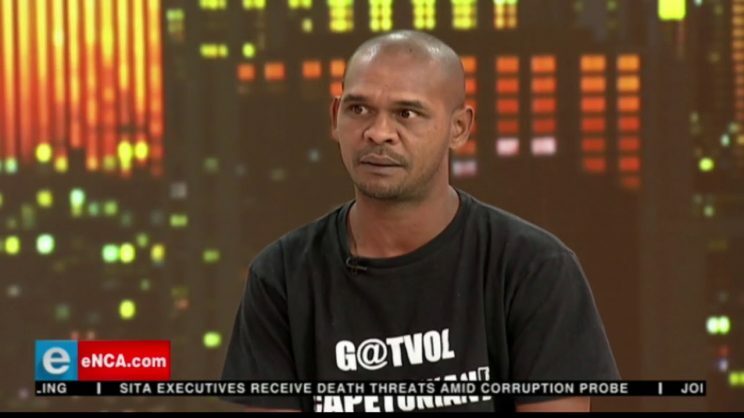 Gatvol Capetonian's Fadiel Adams on eNCA. Picture: Screenshot. A controversial new organisation says it wants an independent Western Cape and for all people not born in the province before 1994 to sell their assets and go home. Fadiel Adams, spokesperson for controversial new organisation Gatvol Capetonian, says they are calling for “all people not born in the Western Cape pre-94 to sell their assets and go home”. Adams and his organisation believe the so-called coloured community in the Western Cape is “growing exponentially poorer as a direct result of the influx from the Eastern Cape to the Western Cape”. Of the largely black Eastern Cape community that is based in the Western Cape, Adams says: “They are a strain on the infrastructure. Our trains aren’t riding because they weren’t designed to cope with this amount of people.” He also said queues were now too long in hospitals. Adams believes that so-called coloured Capetonians are overlooked for jobs in favour of black South Africans. “Last time I read the Freedom Charter, it said that South Africa belongs to all who live in it,” he says, adding these days, that does apply, “except if you live in the Western Cape and happen to be brown”. Adams also confirmed the organisation was fighting for secession. “We want an independent Western Cape,” he said. “We’ve been made to feel apart from the rest of the country anyway. We might as well pack up, close our borders and have our own country. “We can show the rest of South Africa how the democracy project is supposed to work,” he adds, saying that in his vision for the Western Cape “white, black, brown and Indian people will benefit”. He stresses that his organisation’s call for people to leave the Western Cape does not apply to black people, but to “anyone not born in the province pre-94”. He claims that if those causing what he sees as problems in the Western Cape were to be Indian or white, “my attitude would be the same”. “We’ve swapped an oppressor,” he adds, repeating the organisation’s controversial view that the ANC government is as bad as the apartheid government was. “We, the so-called coloureds, liberated the Western Cape,” he adds, reinforcing his calls for his people to reject what he sees as disenfranchisement in the province. Gatvol Capetonian are not the only ones to call for Western Cape independence. The Citizen reported on July 17 that Khoisan king Khoebaha Calvin Cornelius III announced in a video that he had already seceded “the Cape” from the rest of the country.